Canaries and other finches are a very different bird from a parrot. First, canaries are songbirds, and unlike parrots, their bites won’t send you running for a box of bandages. (In fact, my canary has never bitten me, ever.) Parrots are hookbills, identifiable by their hooked beaks for gasping and slicing, while finches have a wedge-shaped beak for hulling seeds. My canary is a wonderful addition to my flock. Pip is not as demanding, she isn’t half as loud, and she is still extremely cute. She still requires my time and energy, however, and is not quite as low maintenance as these birds are often advertised. However, finches are a delight to own. My experience being mainly with canaries, you can go here to learn more about the adorable zebra finch, for instance, another popular pet. Noise: While my canary is nowhere near as loud as our parrots, she has quite a pair of lungs, and can be very noisy all on her own when singing. Mess: Parrots may be very messy, but canaries come in at a close second. Ours is capable of flinging seed and vegetables across the room, and while she is tidier than the rest of the birds, it’s only just. Diet: To live long, healthy lives, finches require a fresh diet, light on the seed. They do NOT need grit. Finches hull their seeds (removing the outer shell). Giving them grit can actually impact them and cause death or extreme sickness. Still need toys: No living creature should be left without things to do, and while not as intelligent as a hookbill, finches are smart in their own way. For our canary, we buy things she can peel the bark off of, bells she can jingle, rope toys she can preen, and food toys she can peck at. Space, please! Canaries being territorial bird, they should always be housed singly. Other finches should be kept amongst flocks of their own kind. Every bird requires suitable space – don’t cram them into small (or round) cages. Make sure your pet can fly and generally move around comfortably. The bigger the better, so long as the bar spacing is okay. They still need your time: Canaries shouldn’t be left without your attention, just as they shouldn’t be left without things to do in their cages. These birds deserve out-of-cage time, too, and you can easily train them to enjoy coming out with you. Their small size makes them much more handleable. They don’t need a 7-foot-tall cage, like an Umbrella Cockatoo, for instance, although they should have a bigger cage than many pet shops sell off the shop floor. Canaries don’t bite (at least, mine never have), and other finches don’t generally draw blood if they do. 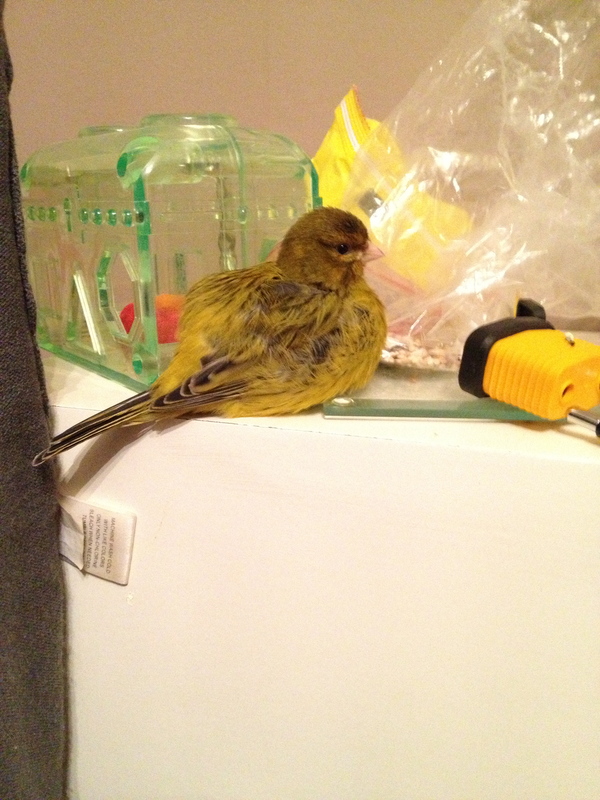 My canary prefers not to be within my reach, but even if I have to catch her (to clip her toe nails, for instance), she will not bite. Canaries sing beautifully. Just don’t count on a quiet house! A singing canary is a happy and healthy bird. They’re beautiful, coming in many feather mutations and forms. Some can be hand-tamed, although you shouldn’t necessarily expect it. Pip isn’t really hand-tamed, and I don’t mind. I didn’t buy her expecting a pet that I could, well, pet. They’re a low-maintenance companion, at least relative to the demands of a hookbill. They may be small and inexpensive, but these wonderful creatures deserve love and compassion. Please, only buy a canary if you can give it a good life. Think how dull it must be to sit forever in a bare cage, with nothing to do but sing. A Parrot (and Family) in Need. How To Make A Grain Bake for Parrots. 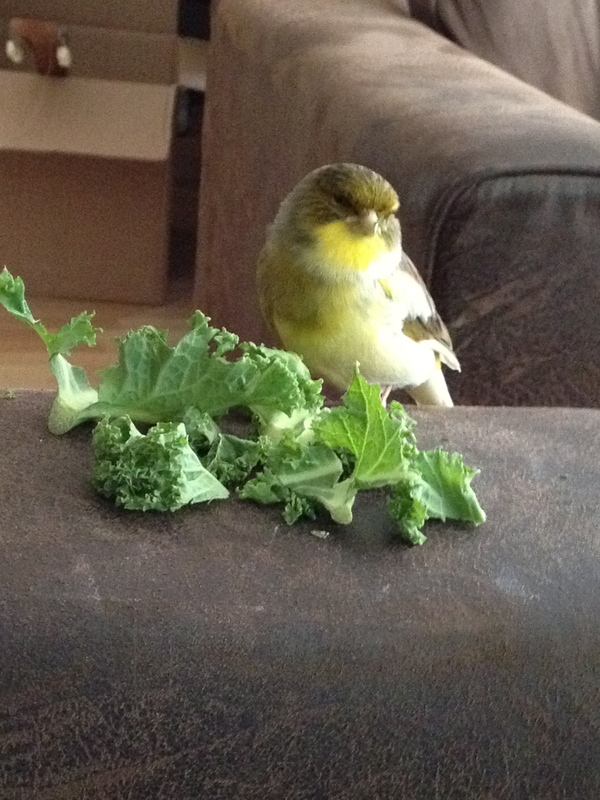 well i did it, I raised a hand-fed finch who is generally cute and adorable all times of the day besides pooping on me…..but now it displays mating behaviours as soon as I let it out of the cage, towards me (my hands or feet) so now I only have parrot reference materials to go from, hopefully it will all work the same. Won’t deny it, it can feel a bit annoying to have it peck at or mount my hand constantly, needs a lot of distracting. I love the last picture. What a happy little bird your Pip is! Honestly, I’d never thought I would have such a strong relationship with a bird, I”ve always thought they were not smart, specifically the canary. But, Here I am calling a bird my best friend and I’m damn proud of it! Folks, Go out and buy a canary, or a bird. You see, my bird has so much life and livelihood in him, I’m sure all those birds at pet-smart or any store are just as capable. Don’t keep them couped up alone, go save a friend. Do you mind helping me aquire a canary and buy its necessities and such. I would love to own one but i fear that i dont know what i should buy for it and how to take care of it.